What’s been happening with the KodakCoin ICO and the KodakOne stock photography portal? Will photographers ever be blessed with the opportunity to get paid in Kodak-branded company scrip? Is KodakCoin promoter Ryde Holding, formerly WENN Digital, really having trouble paying people? The answers are mostly “it’s not going well.” But the future will surely be astounding! Maybe. Photo licensing agency Ryde GmbH had tried and failed to do a KodakOne-like ICO in 2017, in partnership with paparazzi celebrity photo agency WENN Media — on the good old-fashioned “just send us ether! Regulation? What’s that?” model. Ryde met Cameron Chell, founder of ICOx Innovations — who “brought Eastman Kodak and the WENN Digital team together to create the KODAKOne platform and co-architected the KODAKCoin.” Ryde and ICOx secured a licensing deal to use the Kodak brand name on a second attempt at the ICO. Ryde and WENN formed a joint venture, WENN Digital, trading as KodakOne. They would build a stock photo licensing platform! And the professional photographers they hoped to attract would be paid in … KodakCoins! Rather than actual money. Kodak doing an ICO, at the peak of the crypto boom, got the world’s attention in a big way. Photographers still loved the Kodak brand name — they really, really wanted there to be a Kodak that had a healthy business and wasn’t just the brand-licensing tattered and flayed post-bankruptcy hide of what was once a company. So the ICO attracted a lot of attention that it didn’t warrant, just on sentiment for the name. WENN Digital then realised the eyes of the world were upon them — and their ICO would need to be as thoroughly regulation-compliant as possible. I don’t know this for sure — but I strongly suspect that Eastman Kodak, whose New York Stock Exchange listing is one of the few things they still have going for them, told Ryde in no uncertain terms that any ICO would need full and absolute compliance. Listed companies of many decades know to take the US Securities and Exchange Commission (SEC) seriously. The KodakCoin ICO offering was not attractive. 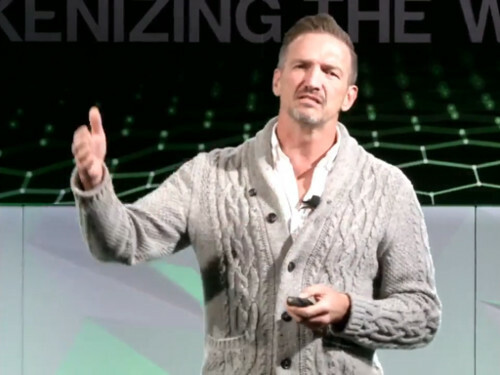 It was restricted to accredited investors — that is, you needed to be rich already. It was a SAFT, or a Simple Agreement for Future Tokens — buyers bought a right to be issued a token in the future, if and when the platform went live. And the buyers couldn’t sell their SAFTs for at least a year. And if KodakOne paid photographers in these tokens — it wasn’t clear if those photographers would be allowed to trade in the tokens unless they were already rich themselves. Even photographers with love for Kodak still in their hearts were less than willing to be paid in magic beans, rather than actual money. We have officially launched our SAFT offering and we are excited about all the commitments over the last weeks. After months of hard work behind the scenes, we are fully compliant under US-Security-Law and our offering is well on its way. We have reached our financial targets both in our Pre-ICO I and II. Our $1 SAFT offering round will remain open until the launch of our platform. It’s nice they finally achieved compliance — two months after first opening their offering, on 21 May 2018. Contrary to this email, the January 2018 pre-ICO second round did not, in fact, reach its target — it aimed for $6,750,000, and netted $880,000. How do we know this? KodakOne told us it had failed, in their leaked offering document — the official statement of their offering, which an investor would reasonably assume was free of material misstatements. Though KodakOne first stated in email that the KodakCoin ICO would run until the KodakOne portal was launched, the ICO closed on 30 September 2018. KodakOne’s partner on the ICO was ICOx Innovations. ICOx was formed in late 2017 as AppCoin, who bought a corporate shell to become a public company — if only an over-the-counter pink sheets penny stock. As of January 2018, AppCoin had two executives, no employees, assets of $195,000 and liabilities of $260,000. Somehow, they were still able to lend WENN Digital $100,000 to get started on their Kodak-branded ICO. AppCoin changed its name to ICOx Innovations in February. ICOx acquired some notable board members — Ed Moy, a former director of the United States Mint who’s now getting into crypto, and Alphonso Jackson, formerly a US Cabinet Secretary and Vice-Chair of JPMorgan Chase. They also acquired — from somewhere — more money to lend to the KodakOne companies. In August, Ryde GmbH put up its software — the basis for the exciting new KodakOne system — as security for a loan of $500,000 from ICOx Innovations. WENN Digital (now Ryde Holding) is a guarantor on this loan — “and any other amounts that we may in the future loan or advance to Ryde.” The loan is repayable as of WENN Digital realising $4,250,000 in finance “whether through the sale of KodakCoins, equity or otherwise,” or 27 March 2019, whichever is earlier. KodakOne hasn’t produced a lot — but it’s been announcing a string of partnerships, though not with much detail. In early June, KodakOne announced its partnership with the Oak View Group, who run sports stadiums, “making KODAKOne and KODAKCoin official partners of six OVG Arena Alliance venues, including four NBA teams and two NHL teams.” They wanted fans who take pictures at events to sign up with KodakOne. “WENN Digital and the six Arena Alliance members will collaborate to build a platform that allows fans to use KODAKCoin Token for an array of in-venue transactions and promotions.” No date was given for this plan. 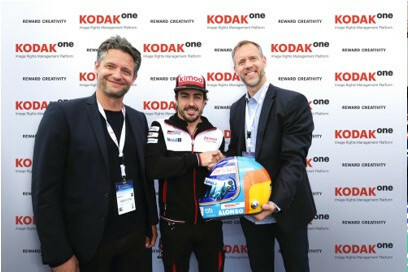 Later in June, KodakOne announced that they had “agreed in principle” with Formula 1 driver Fernando Alonso “to protect his professional and personal images and videos.” They “intend to build a platform” to reward fans who upload pictures of Alonso. In September, KodakOne made a deal with the Lobster photo platform to include all 10 million or so Lobster images on the KodakOne platform. This would achieve the project’s target, as per the offering memorandum, of 10 million images — in one fell swoop! The only mention of KodakOne on Lobster’s site is as a talking point in Lobster’s fundraising blog post from October. So, some sort of deal exists, but there’s nothing to show as yet. This was also the first public release from KodakOne that noted the company was now called Ryde Holding, rather than WENN Digital. I wondered at the time if the name change had happened because Ryde had failed to buy out WENN Media in time — according to the leaked offering document, WENN Digital was going to buy both WENN Media and Ryde GmbH, “conditioned upon, among other things, WENN Digital’s receipt of $10 million in proceeds from the Offerings on or before July 31, 2018.” It looks like the ICO didn’t do well enough. The proper announcement of the name change finally came in October — not from Ryde, but in passing from ICOx Innovations. ICOx frequently namedrops KodakOne in its press releases — it considers KodakCoin a huge success! KodakOne was its first project, after all. And ICOx is looking for other brands to sell ICOs to. “Many cryptocurrencies out there are in search of a way to be useful” — and KodakCoin is no exception, but anyway. 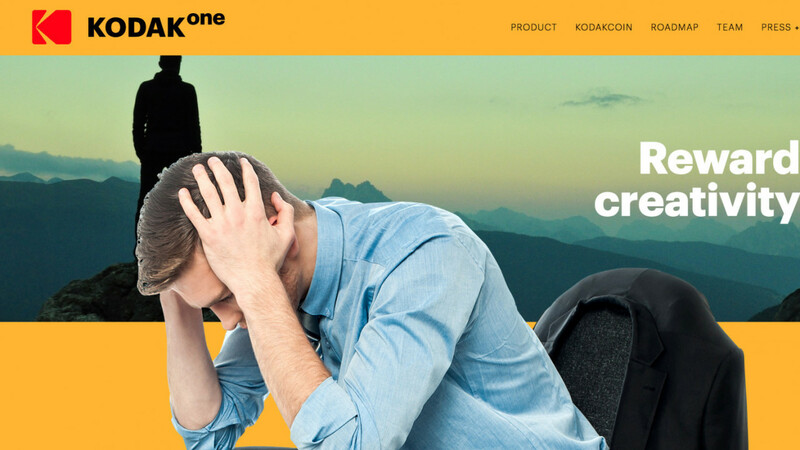 On 19 October, ICOx announced the launch of KodakOne’s Post-Licensing Portal! That’s “launch” as in “not launched yet.” The press release veers between “is” and “will” — with impressive-sounding but non-specific numbers, such as “The KODAKOne PLP is able to handle up to 1 billion images per second” … whatever that “1 billion” is actually counting. The press release said that ICOx would reveal more details at an ICO conference, the Start Engine Summit (platinum sponsor: ICOx Innovations). The conference was live-streamed to YouTube. Here’s a speech from board member Ed Moy, followed by Chell. Chell mentions BitRail, a new entity that was also announced by ICOx that day — he describes it as “a crypto payment platform that’s fully integrated into the banking system.” BitRail will apparently build a payment gateway that KodakOne can use. ICOx press releases only ever seem to mention KodakOne and BitRail — it’s not clear if they’re involved with any other companies. Though ICOx do claim a “pipeline of opportunities” in the press release for their public listing this month on the TSX Venture Exchange, a subsidiary of the Toronto Stock Exchange. So why did the company behind KodakOne change its name from WENN Digital to Ryde Holding? I am Lloyd Beiny, Chairman of The WENN Media Group (WMG) owner of the brand name WENN. In the interest of accuracy, the reader should distinguish between the parties mentioned above and WMG as the good name of WENN has been maligned in this process. WMG which is 30 year old business agreed to license the name WENN to the entity previously called WENN Digital Inc (WDi) who were entitled to use the name “WENN” subject to certain contractual conditions. WDi, who are now known as Ryde Holding Inc failed to raise the necessary funds to meet those contractual conditions and its licence to use the name WENN automatically terminated on 31st July 2018. WMG no longer has any connection with Ryde Holding Incorporated, KodakOne or any individuals mentioned above. Additionally, WMG has terminated its previous post licensing/copyright infringement agreement with Ryde Gmbh and has served notice of its intention to issue legal proceedings to obtain payment of an accounting and monies due under that agreement. After WENN Digital changed its name to Ryde Holding, WENN Media signed up in September with KodakOne’s competitor, Copytrack — who I’ve covered previously. Copytrack also has a stock photo site, with “post-licensing” — doing image searches and sending bills to violators — and protecting copyright using a blockchain, somehow. At the end of January 2018, contracting agency IFindTech was recruiting for the KodakOne project, and contacted Nene. In February, Nene spoke to Jan Denecke and Volker Brendel at Ryde GmbH, who apparently described the project to him in terms of building the platform for Eastman Kodak. By May, Nene had been working on the project for two months and had yet to be paid. Brendel told him he needed to contact iFindTech back in the UK, which turned out not to be the case. Nene was finally paid for March. Volker Brendel requested that we prepare a user centric demo for the investors which would show how an end user would use the platform. As we did not have a user friendly front end, I asked a good friend of mine, Adebayo Dada, to help out. Within two weeks, we had a workable MVP product [minimum viable product] with a sleek user interface. The demo went down pretty well with the investors. 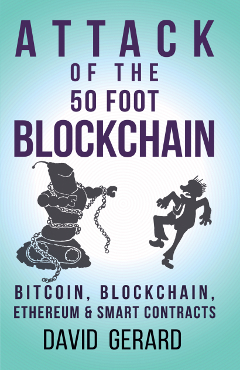 After the minimum viable product demo, blockchain development was no longer a priority. The company hired more staff for administration and big data — but bills were going unpaid. Nene had been paid for only one month of his four months up to that time. The KodakCoin ICO had not gone well. KodakOne couldn’t get investors interested. They had spent money to buy celebrity names, such as Fernando Alonso. They had also tried to recruit Lionel Messi, a footballer for Barcelona, but his team wanted too much money. The deal with Oak View Group had no clear business goal. 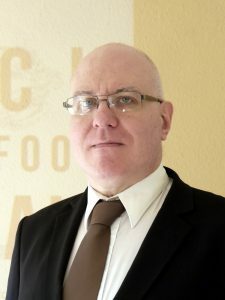 I was in constant contact with Volker Brendel about the arrears of the invoices. He always laid the blame on the CFO and he, Volker, kept giving me guarantees that I would be paid every single penny that they owed me. He also confirmed that the ICO was a shamble and no one subscribed to it. Therefore, they would try to open to all investors across the globe. … They offered me to go permanent on a reduced salary with bonuses and KODAK coins. I am the architect of the KODAK coins and I know they are yet to be released so, what exactly am I getting? Ryde hadn’t paid their permanent staff, their outsourcing agencies and other contractors since June 2018 … October 2018, the full blockchain team had now resigned, the big data team left and the partner agencies had stop working with them. No one in the company was answering emails or calls. There are rumours of multiple lawsuits against Ryde/Wenn Digital/KODAKOne, I have received confirmation of at least 3 of them. The lawsuits all have the same goal, to get their invoices paid. KodakOne called Nene’s story “defamation,” claimed his work for them had been “unsatisfactory,” and said they would be taking legal action against him — but The Next Web quoted correspondence from iFindTech’s lawyers, London Law Practice, on October 26, concerning missing payments to multiple contractors. I have also had multiple previous email approaches from unpaid KodakOne contractors, who back Nene’s claims. KodakOne’s problems paying contractors also rated a passing mention on mainstream TV news — on WHEC, Rochester, New York, home town of Eastman Kodak. The trading price of the Company’s common stock has been dramatically affected by the announcement of the license granted by Kodak to WENN Digital, Inc. (“WENN”) to use Kodak’s brand in connection with WENN’s KODAKOne blockchain-based image rights management platform and Kodak-branded cryptocurrency. Kodak may, in the future, have other involvement relating to blockchain technology or cryptocurrency, either directly or as a licensor. 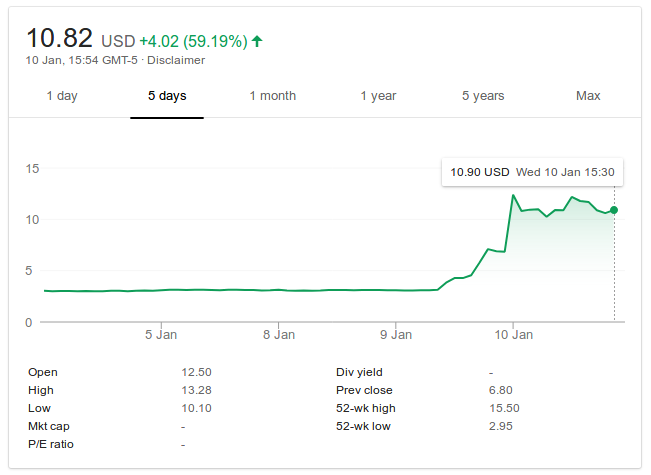 Kodak cannot predict whether, or the extent to which, the trading price of the Company’s common stock will continue to be affected by blockchain or cryptocurrency markets and any volatility in such markets. 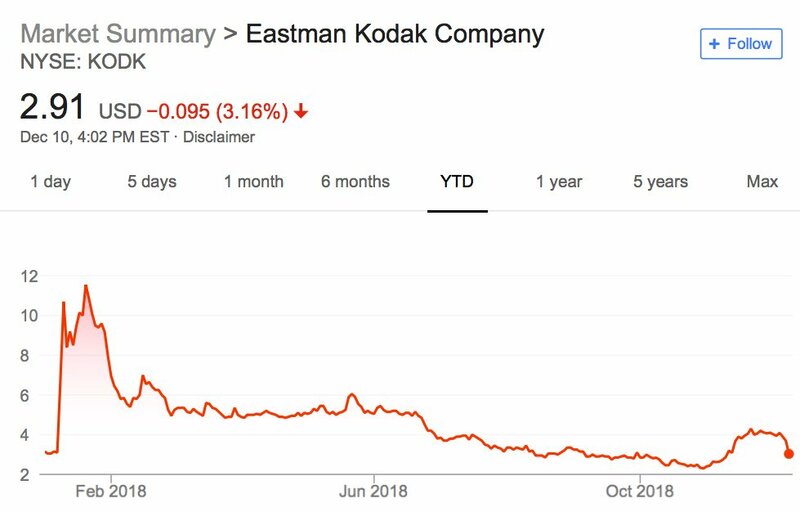 Eastman Kodak have talked up KodakOne enthusiastically, even though it’s just a brand licensing deal, for which they have no direct liability — they seem to be holding out hope that a win in the crypto lottery might rescue them from a second bankruptcy. But I’m pretty sure KodakOne’s lottery numbers haven’t come up. The KodakCoin ICO has been a loser. KodakOne appears to be stiffing its contractors badly. However, KodakOne is still paying ICOx Innovations handsomely for unspecified corporate services — and ICOx may also end up with the Ryde GmbH platform software that KodakOne was to be based upon. But the portal’s gonna be great! Isn’t it? So what happened with that Post-Licensing Portal that ICOx claimed was being launched? That’s out already, right? November 2018, still no payment from Ryde to any of the invoices. Instead the company is publishing fake information on the internet that they are launching their platform in beta mode. This is a lie as the person working on it confirmed that he’s keeping the code as a ransom to the money they owe him. But I’m sure that portal will be ready any time now. Just as soon as KodakOne pay someone to finish it — possibly in advance. A large glass of wine to Amy Castor for two rounds of editing and feedback!